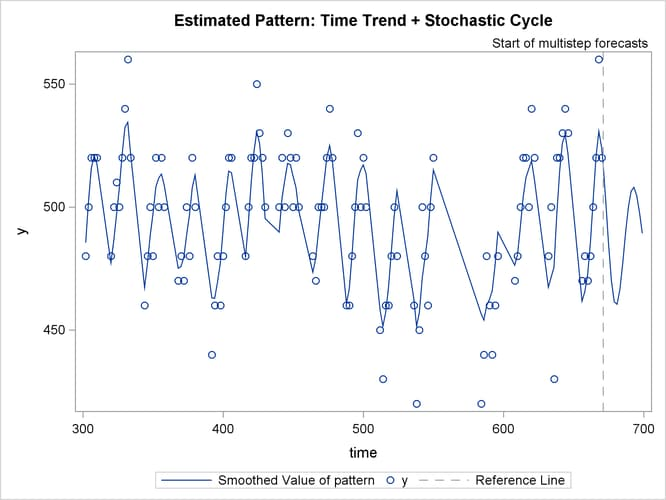 where is a simple linear time trend, is a continuous-time stochastic cycle, and is a Gaussian white noise sequence. Replacing the linear time trend with a more general time trend, such as a spline smoother, does not seem to change the fit, because the estimated smoothing spline turns out to be almost perfectly linear. 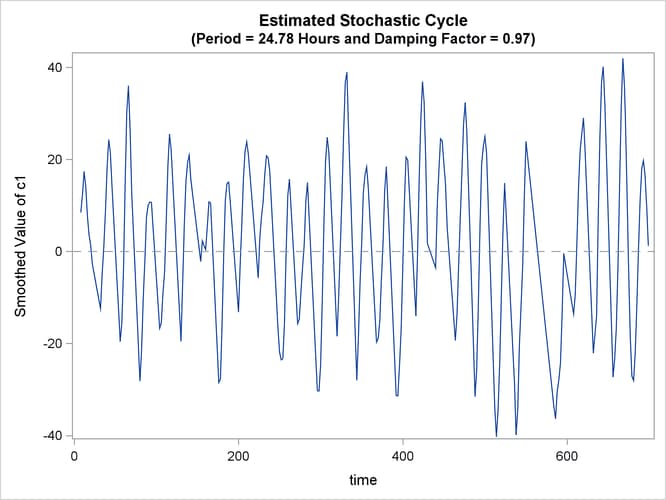 The continuous-time stochastic cycle, named c1, is defined by a pair of STATE and COMPONENT statements. The STATE statement defines s1 as a state subsection that is associated with a univariate, continuous-time cycle (signified by the use of type=cycle(CT)). The COMPONENT statement defines c1 as its first element. Output 27.15.1 shows the estimated intercept and slope of the time trend. The estimated slope (only marginally significant) is negative, which is consistent with the overall downward drift. Output 27.15.2 shows the plot of the estimated cycle component, which has a period of 24.78 hours and a damping factor of 0.97. That is, it is a nearly persistent diurnal cycle. Output 27.15.3 shows the fit of the de-noised y values ( ). To reduce the clutter, only the second half of the data are plotted. The fit appears to be quite reasonable.